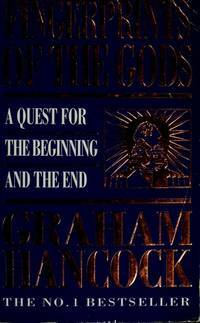 Fingerprints of the Gods is a book first published in 1995 by Graham Hancock, in which he contends that some previously enigmatic ancient but highly-advanced civilization had existed in prehistory, one which served as the common progenitor civilization to all subsequent known ancient historical ones. Supposedly, sometime after the end of the last Ice Age this civilization passed on to its inheritors profound knowledge of such things as astronomy, architecture and mathematics. 1995-04-08. New. Ships with Tracking Number! INTERNATIONAL WORLDWIDE Shipping available. Buy with confidence, excellent customer service! Audio Literature. Audiobook CASSETTE. 1574531093 . Very Good. 1995-06-03. New. Ships with Tracking Number! INTERNATIONAL WORLDWIDE Shipping available. Buy with confidence, excellent customer service! 2004-01-02. New. Ships with Tracking Number! INTERNATIONAL WORLDWIDE Shipping available. Buy with confidence, excellent customer service! 2001-09-07. New. Ships with Tracking Number! INTERNATIONAL WORLDWIDE Shipping available. Buy with confidence, excellent customer service! 2017-07-04. New. Ships with Tracking Number! INTERNATIONAL WORLDWIDE Shipping available. Buy with confidence, excellent customer service! 1996-06-06. New. Ships with Tracking Number! INTERNATIONAL WORLDWIDE Shipping available. Buy with confidence, excellent customer service! William Heinemann Ltd, 1995-04-10. Hardcover. Used:Good. 2017-07-04. Good. Ships with Tracking Number! INTERNATIONAL WORLDWIDE Shipping available. May not contain Access Codes or Supplements. May be ex-library. Shipping & Handling by region. Buy with confidence, excellent customer service! Doubleday Canada, 1998-06-01. Paperback. Used:Good. Crown. Hardcover. 0517593483 New Condition *** Right Off the Shelf | Ships within 2 Business Days ~~~ Customer Service Is Our Top Priority! - Thank you for LOOKING :-) . New. William Heinemann Ltd. Hardcover. 043431336X New Condition. . New. William Heinemann Ltd. Hardcover. 043431336X Like New Condition. . Fine. New York: Crown Publishing. 1996. First Edition; First Printing. Softcover. 0517887290 . Very Good in wraps. Light foxing on text block. ; 9.1 X 6.1 X 1.8 inches; 592 pages . 1995-04-08. Good. Ships with Tracking Number! INTERNATIONAL WORLDWIDE Shipping available. May not contain Access Codes or Supplements. May be ex-library. Shipping & Handling by region. Buy with confidence, excellent customer service! Penguin Random House, 2001. Paperback. New. London: Heinemann. Very Good+ in Very Good+ dust jacket. (1995). Hardcover. 043431336X . No signatures. Dust-jacket protected in archival mylar cover. ; UK edition. Reprint (in same year as first publication). [x], 578 pages + plates. Blue boards with gilt lettering on spine. Page dimensions: 234 x 154mm. Photographs by Santa Faiia. Alternative history. Anthropology and pre-history. "In ancient ruins as far apart as Egypt's Great Sphinx, the strange Andean temples at Tiahuanaco and Mexico's awe-inspiring Pyramids of the Sun and Moon, he reveals not only the clear fingerprints of an unknown people who flourished during the last ice age, but also disquieting signs of high intelligence, technological sophistication and detailed scientific knowledge of the cosmos aeons before any previously known civilisation." - from dust-jacket blurb. .
Doubleday Canada. PAPERBACK. 0385258283 New Condition. . New. Arrow Books Ltd. PAPERBACK. 0749314540 New Condition. . New. Crown. Hardcover. 0517593483 New Condition. . New. Crown. PAPERBACK. 038525475X New Condition. . New. Seal Books. PAPERBACK. 0770427251 New Condition. . New. Arrow Books Ltd. PAPERBACK. 0712679065 New Condition. . New. Crown Publishers, New York: 1995. Softcover. Very good condition. The author of the best-selling The Sign and the Seal takes readers along on a quest for proof of the existence of an ancient advanced civilization--not Atlantis--that predates Egyptian, Hittite, and Chinese cultures. An irresistible mixture of historical detective work, hard science, and recent discoveries in ancient places. Includes an Index. ISBN: 0517593483. William Heinemann Ltd, 1995-04-10. Hardcover. Good. Mandarin / Reed Books, 1995-01-01. Paperback. Used:Good. Crown Publishers, 1995. First edition stated, with full number line. Unmarked copy showing some reader's use and handling, VG/VG. Quarter bound in black cloth. 578pp., index, illustrations. Unclipped jacket now in a new mylar cover.. First Edition. Hardcover. Very Good/Very Good. 8vo - 8" - 9" Tall. THREE RIVERS. New. 9.19 x 6.22 cm. New York: Crown Publishers, Inc. / Doubleday, 1995. Very good condition with only minor signs of external wear and some text annotations and underlining. Inscribed with previous owner's name.. New York, Crown Publishers, Inc. / Doubleday, 1995. 15.5 x 23.5cm. 578 pages, with black and white plates. Original softcover. Very good condition with only minor signs of external wear and some text annotations and underlining. Inscribed with previous owner's name. By the author of "The Sign and the Seal". This book describes the quest for the whereabouts, nature and few surviving traces of a lost civilization that was destroyed long ago and obliterated from human memory, long before any of the cultures of historical antiquity rose to prominence. While Hancock does not believe that this civilization was Atlantis, he taps into the same current of human yearning that has made the Atlantis myth such a powerful one. He mixes physical exploration of dramatic and sometimes dangerous locations in his pursuit of the hints and scraps of evidence that point to a great and unsolved mystery. 2001-09-07. Good. Ships with Tracking Number! INTERNATIONAL WORLDWIDE Shipping available. May not contain Access Codes or Supplements. May be ex-library. Shipping & Handling by region. Buy with confidence, excellent customer service! 1996-06-06. Good. Ships with Tracking Number! INTERNATIONAL WORLDWIDE Shipping available. May not contain Access Codes or Supplements. May be ex-library. Shipping & Handling by region. Buy with confidence, excellent customer service! 1995-06-03. Good. Ships with Tracking Number! INTERNATIONAL WORLDWIDE Shipping available. May not contain Access Codes or Supplements. May be ex-library. Shipping & Handling by region. Buy with confidence, excellent customer service! William Heinemann Ltd. Hardcover. 043431336X FIRST CLEAR PAGE MISSING, WITH DUST JACKET . Good. William Heinemann Ltd. Hardcover. 043431336X . Fair. Arrow Books Ltd. PAPERBACK. 0712679065 Like New Condition. . Fine. Crown. Hardcover. 0517593483 Like New Condition. . Fine. Arrow Books Ltd. PAPERBACK. 0749314540 Like New Condition. . Fine.